We are going to talk about how booms and busts affect Innovation. 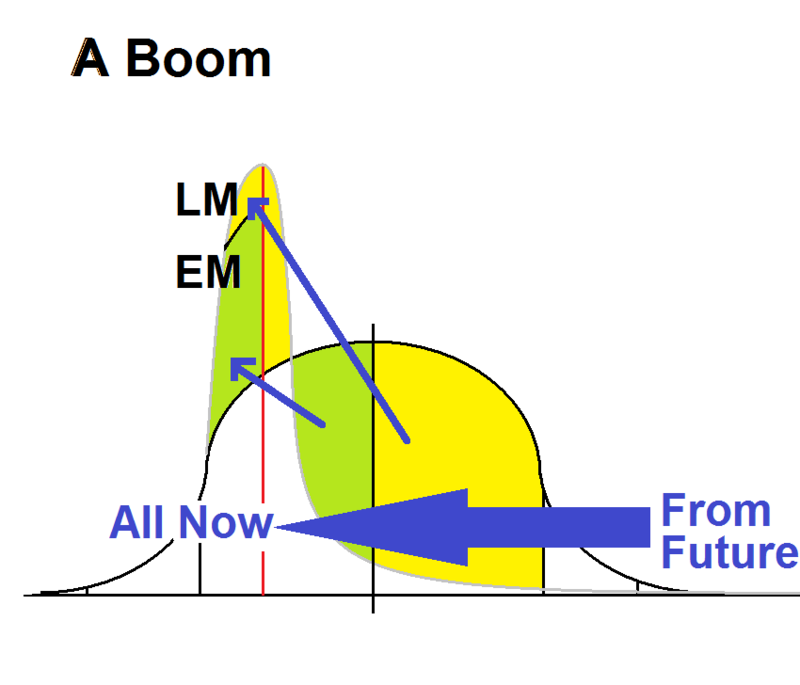 To see the effects of booms and busts, we’ll start with Moore’s Technology Adoption Lifecycle. While this lifecycle is typically associated only with discontinuous innovation, it actually covers all innovations and their markets. The effects of booms and busts are the same regardless of whether the innovation is continuous or discontinuous. The normal curve converges with the x-axis at both extremes. It converges long before infinity. This is a Borel set. A Borel set has a fixed, finite number of set members. This is a fixed population of prospects and customers. Each time we close a deal we consume some portion of this population. We have a smaller population to sell to once we close that deal. Births can increase the population under the curve. Deaths can reduce it. Opening a foreign market will increase the populations under the curve. Exiting such a market will decrease the population under the curve. Moore partitioned the total market into partitions. Time starts on the left and proceeds towards the right. Regardless of what market you enter, the lifecycle of your product, market, and organization move to the right. Prospects and customers are consumed, likewise, from left to right. Customers are serialized. The position of a particular prospect or customer within the population is fixed by their risk tolerance along the vector of differentiations that comprise an offer. Sales reps close a certain number of deals in a given time period. Those sales are serialized for each sales rep. Many sales are happening in parallel, but they close serially for a given sales rep. A sales rep cannot close two deals at the same time. Telesales, internet sales, B2B and B2C are different, and have different close rates. For our chat we can ignore the specifics here. Each sale converts the prospect into a customer. Each sale increases the number of customers. Each sale reduces the number of prospects. Each sale moves time to the right by the number of seats sold. 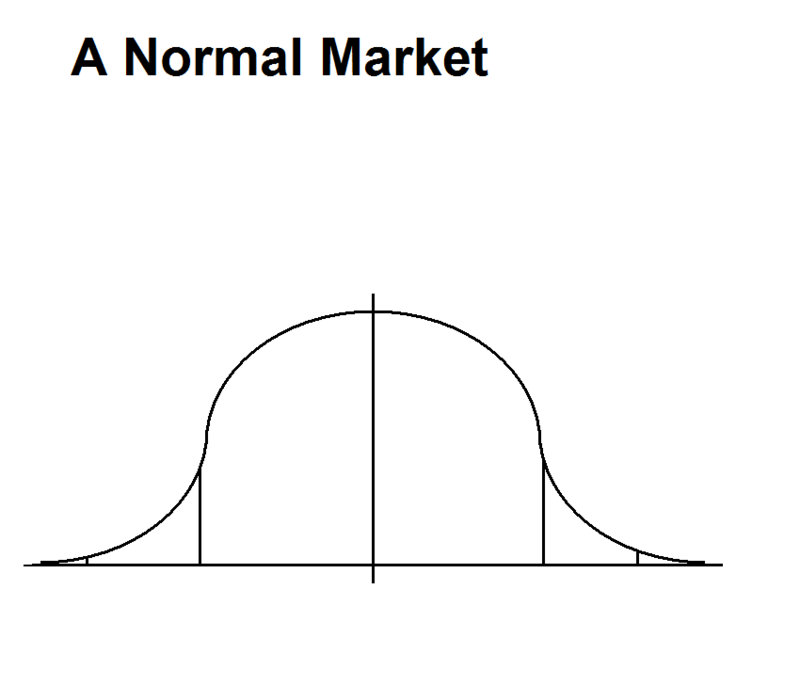 Given that the normal distribution contains millions of seats, it would be difficult to see the movement along the lifecycle on a day to day basis. It would be easier to see quarterly. Since it takes a sales rep a certain amount of time to close a deal, the sales rep can be seen as a clock. It takes a certain amount of time to consume a market, close all the deals in a given market. Likewise, it takes a certain amount of time to close all the deals in an adoption phase. Management has control over these rates and time frames. A boom speeds things up. The distribution skews the normal curve to the right. A boom pulls the future into the present. A boom shifts all subsequent market phases towards the present. The red line illustrates how the transition between the early mainstream and late mainstream has been pulled into or towards the present. The increase in sales increases the height of the normal distribution. In a boom, you may actually start selling your product to prospects in an earlier phase. This creates confusion. In the confused situation, the later market phase will stack on top of the current market phase. The later market phase needs a task sublimated interface and other offer changes. That these changes are actually made in a timely manner is unlikely. They may have been planned, but their planning clocks need to be advanced. Then a bust happens. The population under the curve that has not yet been consumed return to their usual position in the lifecycle, but the bust skews them further to the left, the far left. Or, they are moved into the distant future relative to your sales clocks. A Bust on Moore's Technology Adoption Lifecycle. 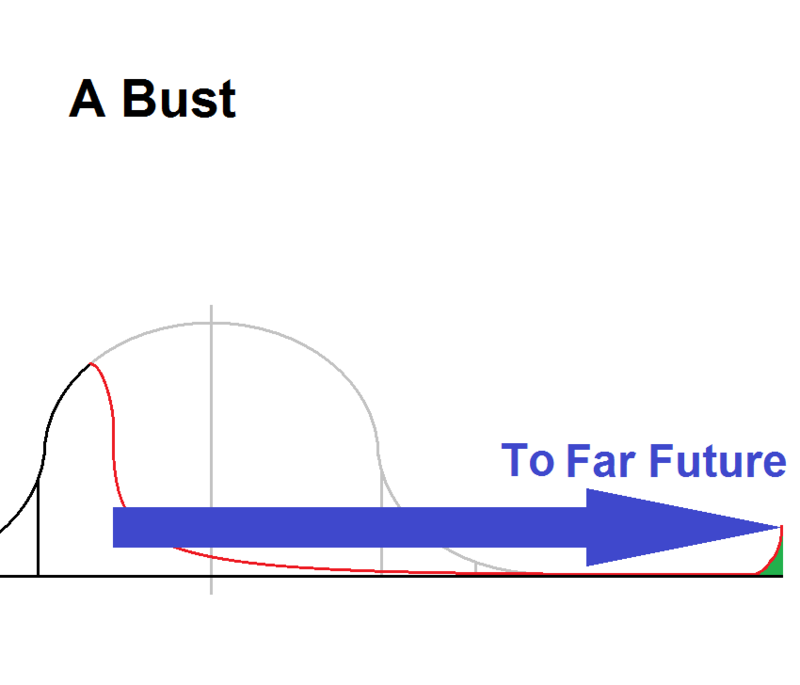 In the figure the bust is happens beginning with market in its normal state, rather than more typically, following a boom. The housing boom sold the future, so now we will have to wait deep into the future before we sell more homes. Affluence reduces birthrates, so don’t expect births to advance the sales clock of homes. Join the #innochat discussion on Wednesday, July 12, at noon EDT. This entry was posted on August 9, 2010 at 12:11 am and is filed under Uncategorized. You can follow any responses to this entry through the RSS 2.0 feed. You can leave a response, or trackback from your own site.